Cowboys DE Jeremy Mincey says he has a lot of love for Bill Belichick even though the Patriots let him go. Cowboys defensive end Jeremy Mincey has some emotional ties to Dallas’ next opponent — the New England Patriots. The Patriots were the team that drafted Mincey in the sixth round of the 2006 NFL Draft. Mincey made it all the way until final cuts, but ultimately he wasn’t a good fit for the Patriots’ defensive scheme. Mincey understood Belichick’s reasoning for cutting him, but that didn’t stop him from pursuing his NFL dream. 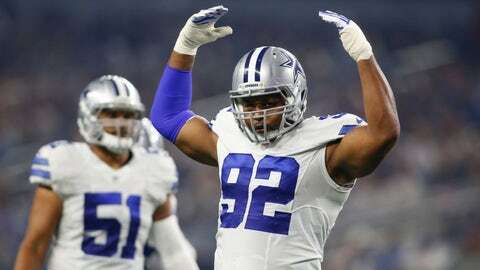 Mincey played for the Jacksonville Jaguars and Denver Broncos before ultimately joining the Cowboys in 2014. In a 2014 interview, Mincey told ESPN’s Jean-Jacques Taylor that he isn’t trying to prove anything to the Patriots. Mincey recently thanked Belichick on Twitter. @CSNNE @tomecurran tell Bill I said thank you for the opportunity that opened life changing doors for me. Forever Grateful. This Sunday’s matchup between the Patriots and Cowboys will feature the story of a player who surpassed many obstacles to continue playing the game he loves.